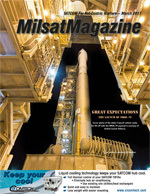 However, communicating in X-band frequencies can be technically challenging, as well. 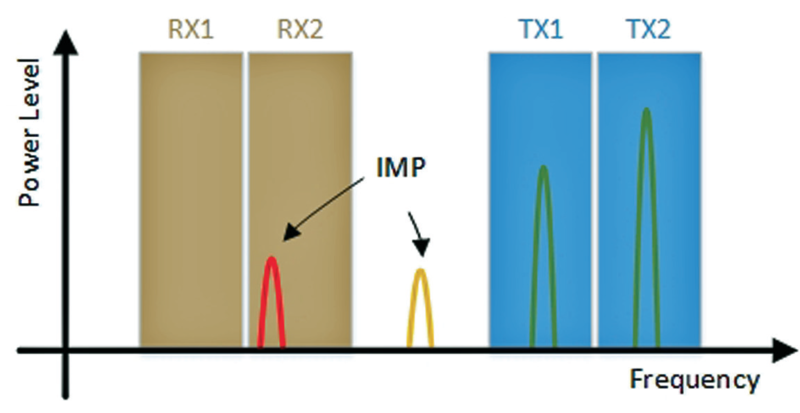 X-band transmit signals require active filtering, and receive signals are vulnerable to unintended passive intermodulation (PIM) products, which cause signal degradation and distortion. The frequency ranges for X-band, as designated by the International Telecommunication Union (ITU), are 7.25 GHz to 7.75 GHz for space to Earth communications (receive) and 7.9 GHz to 8.4 GHz for Earth to space communications (transmit). This unusually narrow separation between receive and transmit sub-bands makes X-band inherently vulnerable to the generation of unintended intermodulation products (IMPs) that can lead to interference and disruption. There are two types of IMPs: active and passive. Active IMPs are generated through an active component, such as the transmit amplifier. The problematic IMPs can be filtered and rejected within the amplifier using established filter design techniques. Passive IMPs (PIMs) are typically the most troublesome, as discussed in detail below. 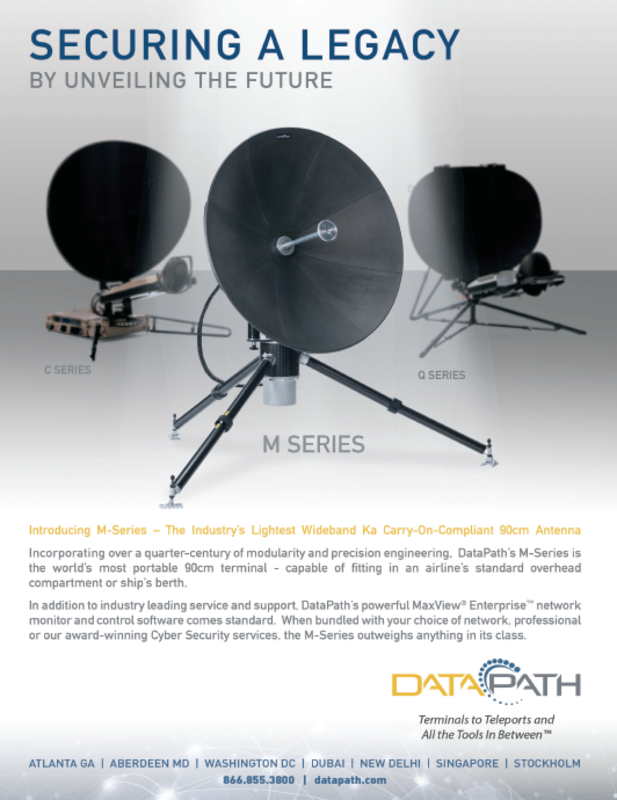 Satellite communication antennas operate with simultaneous transmit and receive signals traveling through RF “pathways” in critical, passive components that are shared, such as the feed horn, polarizer and diplexer. PIM occurs in X-band systems when two or more high power tones generated by active components (amplifiers) in the transmit band mix at device “nonlinearities” such as standard waveguide flanges or other surfaces where microscopic discontinuities or corrosion may naturally occur. The higher the transmit signal amplitudes, the more pronounced the effect of the nonlinearities and the more prominent the undesirable consequences in the receive band. The foundation of PIM effects is the use of two distinct frequencies in the antenna, whereby a non-linear passive component is excited by both frequencies simultaneously. When the intermodulation interference products are generated by the nonlinear materials in the passive components, they appear as the sum, or the difference, of the two original signal frequencies. They also may add in a manner where either, or both, of the original frequencies are multiplied by an integer as well. Typically, however, as the order of these integers increases, the amplitude of the product decreases. Nonetheless, as the number of channels increases, the number of possible intermodulation products increases very rapidly, ultimately making systems with an increased number of channels more susceptible to passive intermodulation. Material selection for PIM mitigation is critical. Metals to avoid on antenna components include ferromagnetic metals such as ferrites, nickels and steels, including some types of stainless steel. These materials exhibit hysteresis when exposed electromagnetic phenomenon, resulting in PIM products. Metals that oxidize quickly or produce significant amounts of rust also should be avoided. PIM detection and measurement can be challenging. PIM products are typically low level compared to signals intended for data transmission. But, due to the fact that transmitters share many of the same transmission lines as the receiver (as parts of the antenna and feed system), even low level PIM products can cause significant problems. One common application for X-band communications by the US military is communicating with drones. Data, imagery and streaming video collected by unmanned systems can be relayed to soldiers in remote locations who receive it with X-band antenna systems. If the antenna system is experiencing PIM, the receive signal can be degraded to the point that the feedback loop fails and communications are lost, or the data being received is so degraded it’s unreadable. RF systems installed on mobile platforms intended for use during transit are of particular vulnerability to the effects of PIM. It has been shown that mechanical vibration and motion directly impact the levels of intermodulation products produced at metal-to-metal junctions. Unmanned aerial systems, for example, are airborne platforms whereby operations depend on the integrity of the RF communications links for command and control. For an airborne platform, mechanical strain due to motion and vibrations are pronounced in comparison to more inert fixed environments. In this case, the effects of PIM causing a communications outage could not only result in the loss of the vehicle, but threaten the safety of persons located on the ground. For marine environments, the constant motion of the vessel due to rolling seas may play a more significant role than the vibrations experienced on an airborne platform, but nonetheless create an environment whereby the impact of PIM needs to be considered more substantially. PIM is a reality of RF systems that directly threatens operational readiness for military communications as soldiers rely heavily on a constant flow of information. Though this effect can be subtle, soldiers in theater are often in harsh environments—hot and sandy or damp and salty—that can create or hasten PIM-inducing issues on an antenna. As such, many US military communications programs specify that antennas must be designed and produced as “Low PIM” in an attempt to mitigate the issue altogether. Satellite and marine systems also are inherently more susceptible to PIM effects. This is due in part to the fact that high power transmitters and low-noise receivers are used in the same system. When the intermodulation products generated from the high power signal become significant in amplitude and when they fall into the receive band of the system, the communications link is jeopardized. Marine systems have the added challenge of corrosion susceptibility, resulting in the potential for PIM generation well after the systems are initially tested and deployed. An antenna designed to be Low PIM, simply stated, is a well-engineered antenna made with high-quality components whereby special consideration is given to PIM. At AvL Technologies, a Low PIM antenna is designed with a holistic approach, such that every component and subsequent metal-on-metal junction in the signal path is considered. Design is not simply done as individually cascaded components in the signal path. Considering the interface of these components as a collective is a critical step to ensuring the system is resilient to PIM—not only at the time the system is delivered to the customer, but as the system ages it is not prone to developing effects that would induce PIM. Thus every metal-to-metal interface in the system is considered. The waveguide components for example, are made of high-quality materials that are explicitly made to be the same materials in the feed to avoid a metal on metal junction that would induce oxidation. This is the same for the OMT and the polarizer components. Cables and connectors are an extremely common source for causing PIM. AvL selects these materials carefully and incorporates them into each antenna design in a way that minimizes susceptibility to motion. 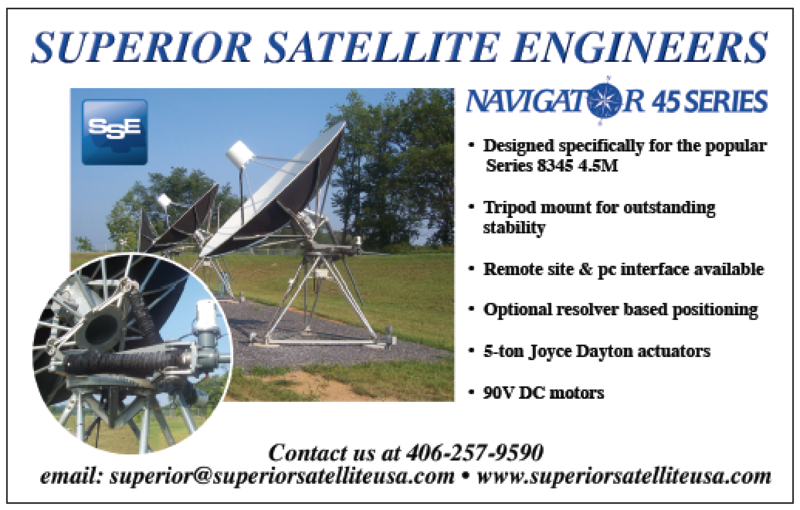 AvL antenna designs also ensure that the connectors are solidly mated and environmentally sound to keep moisture from causing rust and keeping debris out. During the manufacturing process for cable assemblies, AvL uses cable and connector termination processes that help reduce oxidation. These processes over time, due to the flow of RF signals through the cable and connector transitions, are intended to protect the system from developing oxidization and resulting in increased susceptibility to PIM. This holistic approach to designing and manufacturing antennas is a trademark of AvL products. All AvL antennas are designed to be extraordinarily sturdy, efficient and reliable. Antennas produced for military applications are designed to be operated in extreme conditions and many are MIL 810 compliant or qualified—in addition to being designed for Low PIM. Ian Timmins, Ph.D., is the Principal RF Engineer at AvL Technologies. 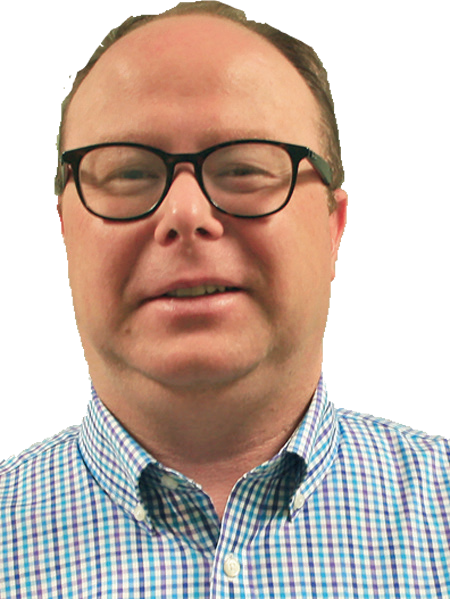 Prior to joining AvL, Ian was VP of Engineering for Optical Cable Corporation’s Enterprise and Harsh Environment lines of business. He previously held technical roles with Dell Computer Corporation, Cisco Systems and COM DEV Space Group. Ian holds a Ph.D. in Electrical Engineering and is an adjunct professor with Western Carolina University.